Ritchie was a product of the Chelsea Youth system, and spent two years at Stamford Bridge without playing a first team game. He was released in June 1996, and joined Southend United, making his debut in January 1997, but after just one further League appearance, was released at the end of the season, dropping into the non-league scene with Welling United. 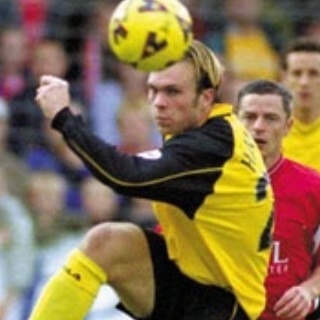 The midfielder came to the attention of Brian Talbot, and he joined Diamonds on 13 May 1998, for a £20,000 transfer fee. He played only eight games for Diamonds but impressed enough for Barry Fry to take him to Peterborough United in December 1998, in an exchange deal that took Miquel de Souza from Peterborough to Nene Park. Ritchie spent part of the 1999/2000 season back with Welling United where he scored 14 goals, before being recalled by Posh. He scored Peterborough’s goal which saw Chester City relegated to the Conference in April 2000, and played as a substitute in the play-off final victory over Barnet the following month. He played in about half of the Peterborough games in Division 2 the following season, and in his spell at London Road, he played 56 games, scoring 3 goals. After Diamonds promotion to the Football League, Brian Talbot brought him back to Nene Park on 10 September 2001 in order to strengthen the squad, agreeing a £30,000 fee for the contracted player. After helping Diamonds reach the Division 3 play-offs in the 2001/2002 season, he picked up a serious injury in a pre-season game at Stamford in July 2002, and missed the entire 2002/2003 season. On his return to fitness, Diamonds were in Division 2 and he had to adjust quickly to the game at a higher level. With the Diamonds relegated at the end of that season he was released in May 2004, and joined Stevenage Borough. In December 2004 however, he went on loan to Lincoln City, before joining the Imps on a permanent basis the same month. 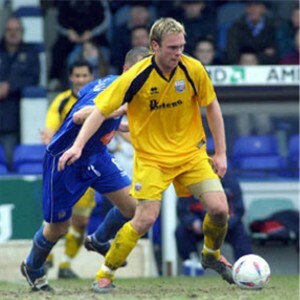 After a brief period with Weymouth at the start of the 2005/2006 season, he joined Cambridge United in September 2005, but was eventually forced to retire from the game in January 2007 due to a knee injury. He had a spell in management becoming one of the youngest managers in the country with Conference South side St Albans City in May 2007 following their relegation from the Conference. After poor results in the opening 10 League games however, he was dismissed on 24 September 2007, and decided not to continue in management. However, he became joint First Team Manager at Kings Langley FC prior to the 2012-13 season, taking them to successive promotions from Step 5 to Step 3 in the 2014-16 seasons. He took on a similar role with Hayes & Yeading FC before stepping down, but remaining involved with junior football at Berkhamsted FC.